Refund policy: Registrations that are cancelled less than 7 days prior to the class start date are subject to a cancellation fee of $25. Cancellations more than 7 days prior to the class start date, will be refunded in full less a $10 fee for credit card refund processing. DO NOT click Back or Refresh after clicking "Register". Do not refresh the page while your registration is processing. 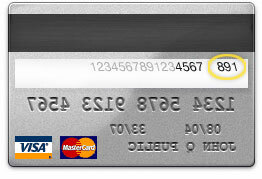 We ask for this information for your security, as it verifies for us that a credit card is in the physical possesion of the person attempting to use it. Office Hours: Monday-Friday 9 AM - 5 PM.